Military delegates arrive at the Great Hall of the People during the opening ceremony of the National People's Congress in Beijing on March 5, 2016. (Fred Dufour/AFP/Getty Images). While China saw the lowest growth of its military budget for the last six years, amidst a slowing economy and tensions in the South China Sea, it has increased its spending on public security by 5.3 percent, to reach a total of 166.8 billion yuan (about $25.6 billion). The announcement was made in a report entitled “About the Central and Local Budget Implementation in 2015 and the Draft of Central and Local Budgets for 2016” which is set to be reviewed soon by the National People’s Congress, the Chinese regime’s rubber stamp legislature. Last year, domestic security spending stood at 154.1 billion yuan (about $23.6 billion) after an increase of 4.3 percent from the previous year. 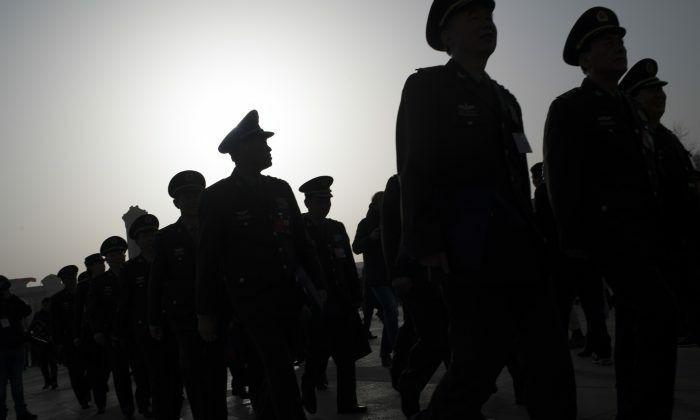 The money is being spent on China’s vast network of security organizations, facilities, and personnel, including the paramilitary police, uniformed and secret police, courts, jails, and more. In 2013, it was widely reported that the Chinese regime spent more on public security (769 billion yuan) than on the the People’s Liberation Army (740 billion yuan). Since then, however, the regional budget on public security has been concealed from the overall expenditure, according to Radio Free Asia. Petitioning refers to the process of individuals traveling to Beijing or their provincial capitals in an attempt to gain redress or justice for abuses they say they suffered in their cities of residence. Beijing authorities have continued to run so-called black jails, locking up petitioners who come to the capital to air their grievances. These individuals often face torture or other mistreatment while incarcerated, and they face other potential persecution once sent back to their homes. Ni Yulan, a well-known activist on the rights of disabled people to housing, said the increase in public security spending goes hand-in-hand with an increase in repression. The likely deployment of powerful radar by China in the South China Sea signifies China's attempt at “effective control” over the disputed waters.